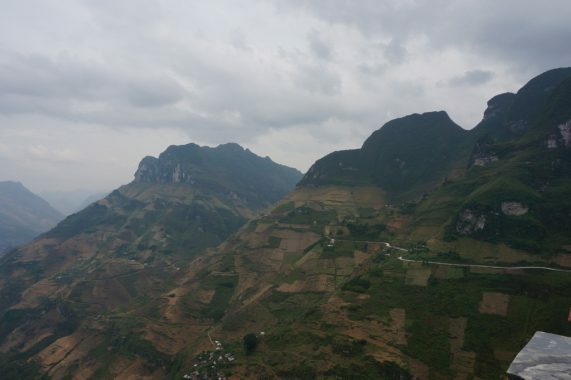 On this post, you’ll find why you should choose Dong Van, in the Ha Giang province, instead of Sapa; and all the information that you need to plan your itinerary in this area. Also, I’ll tell you the places I visited and I will show you photos and a map with the hiking route we did along the geopark. 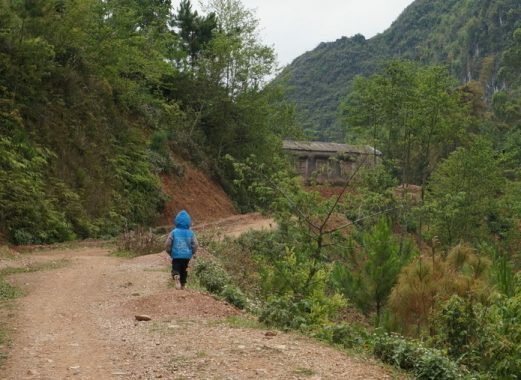 Until very recently, Ha Giang, specifically Dong Van region, weren’t well-known areas because of the difficult access and the poor conditions of the roads for tourists. It’s changing, and increasingly the travellers add this destination to their trip. Currently, visiting the markets and hiking between the small villages are like going over a virgin area, you’ll see only local people. But, why would you go there and not to the fabulous and famous Sapa? Because Sapa isn’t so amazing anymore. A multitude of tourists arrive every day by train and they are harassed by the Vietnamese to sell them some souvenirs or tours. I’ve to recognise that I haven’t been to Sapa but, before deciding which places we would go to visit in the north of Vietnam, I searched much information about several options. I’ve read a lot of blogs and stories, and I’ve seen many photos. Some travellers liked the experience a lot but others didn’t. The most of them agree with the high number of tourists (too many) and how the kids and adults insisted on selling them something (besides, these children don’t go to the school because their parents send them to sell). Even in the Lonely Planet guide, you can read (Spanish version): It is important to realise that the main paths are extremely popular so that there are villages where groups of hikers pass every hour. I read another story that drawed my attention. It was ‘the toll’ that they had to pay if they hiked without a guide. If they wouldn’t have paid, they wouldn’t have been able to continue along the way. So, if after reading this post you still want to go to Sapa, you should be aware of what you are going to find and be mentally prepared to avoid disappointment. 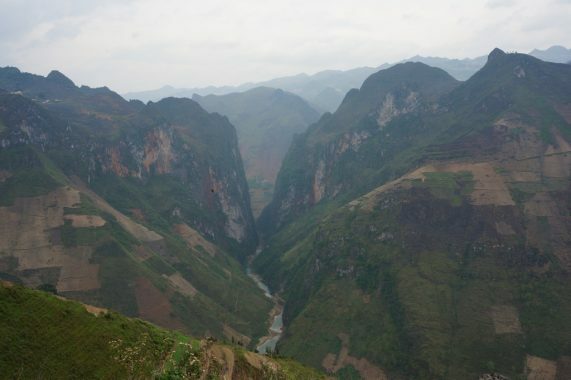 And why are Dong Van and the Ha Giang province so fantastic? Because they have all you can do and see in Sapa but with these other advantages: you can visit the amazing Karst Plateau Geopark included by the Unesco in the List of UNESCO Global Geoparks; and the number of tourists, right now, is low. You can visit markets and small villages calmly. You’ll see the children in the school, how they play in the schoolyard, how they run away from you and how they look you thinking ‘Who are they? What are they doing here?’. In fact, during the trekking route, no one said us ‘hello’; only a few kids waved to us during their playtime, and a man invited us to his house. Also, you’ll see how the Vietnamese work the land or how they carry their harvest or many canes on the motorbikes or the hampers. In short, you can feel how is the authentic life of the northern people and the ethnic minorities. The only disadvantage is getting to Ha Giang. It takes 7 hours by bus and, from there to Dong Van, another 4 hours or more, but the time spent to go there it’s totally worth. Most of the information about this place was obtained from this web: Vietnam – Ha Giang. 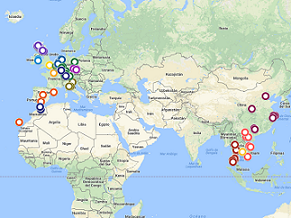 It’s a blog of a traveller with a lot of useful data. You can read about many places to visit like: Dong Van Karst Global Geopark, Meo Vac, Hmong king’s Palace, Ma Pi Leng Pass, Hoang Su Phi and other interesting places. Also, there is a list with all the markets around Ha Giang and their opening day. Besides, on that web there is transport information, where to sleep and the best season to go. You need to ask for permission to visit the remote areas in Ha Giang province. On the web you can read where to buy it and how much is it. At the end of the page, there is a map where he indicates the mentioned places, viewpoints, accommodation, gas stations, etc. This map is handy if you go on your own. Would you like to use it during your trip on offline mode, without the Internet? Then you need to read: Take my Google maps for your trip and check them while offline. Visiting some markets of the province. The most famous are Dong Van and Meo Vac market. Keep in mind that the majority of the markets are opened only on Saturdays or Sundays. Trekking along Dong Van Karst Plateau Geopark. It’s the most beautiful area in northern Vietnam, you shouldn’t miss it!! In the section about My Experience I include a map where you can see the routes we did. Staying one night (at least) with an ethnic minority family. 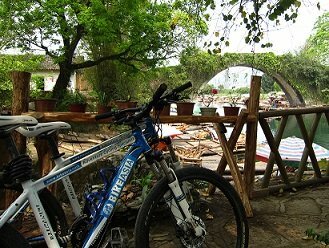 On Tips to plan your trip to Vietnam – Homestay there is important information about this experience. Touring along the road between Dong Van and Meo Vac. This road is called Ma Pi Leng Pass, and there is a great viewpoint over the Nho Que River. During the way there are lovely views, so you’ll want to stop every few meters!! Besides, if you stay one night in Dong Van you’ll have time to climb to the French Fort called Don Cao. The whole village can be seen from there, it’s a nice landscape. I’ve indicated the trail start on my map below. Walking around the old town is also a good idea, you’ll see traditional houses made of adobe and wood. If you have time enough, you can maybe add to your itinerary the Ba Be National Park. To consult information like how to get there, interesting points: this website (it’s a travel company web). 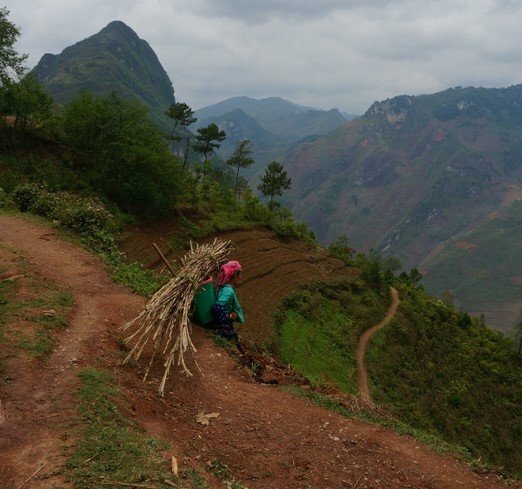 There are several options to prepare your trip along Ha Giang: by motorbike, hiring a tour, by public transport or a mix of them. Public transport is a choice I don’t recommend you because you should adapt to the buses timetable. Besides, they don’t stop to enjoy the views. Make your choice based on the time you have, your preferences and your budget. Rent a motorbike. The most selected option for the travelers. You can read many experiences on the Internet: tips, itineraries, hotels. I think it is the best choice if you have time enough to do the route calmly. If you choose this alternative, check this information to know if you can drive a motorbike and what you need: Tips to plan your trip to Vietnam – Renting a motorbike. Public Transport. There is transport (minivans) from Ha Giang to Dong Van or Meo Vac. However, there isn’t any transport yet between Dong Van and Meo Vac (you can rent a motorbike or a vehicle with driver for this journey). This situation may change soon because of the number of tourists. On this website, in the section Getting there & Away, there is some information about the frequency and the journey time but I don’t know if it’s reliable. I suggest you to book an accommodation (at least for one of the nights) and to ask them about the transport. Hire a tour. This is the most expensive option although you will use your time to the greatest advantage. It’s the best option if you have only a few days to visit the area. You can hire a tour by car or by motorbike. We had only 3 days so we decided to hire a private tour by car. In the next section, I detail more about our trip. A mix of the above options. You can go by public transport to Dong Van and then, rent a motorbike and explore the area (Meo Vac, Ma Pi Leng Pass, markets). If you want to go trekking you can find easily a tour of one or two days. ➽ Day 0 – 8 pm we took the night bus from Hanoi to Ha Giang, at My Dinh Station. When we hired the tour they booked two tickets for us. ➽ Day 1 – We arrived at 3.30am, and they picked us up by car. We slept during 3h in Ha Giang, in a guesthouse. In the morning, we went over Ha Giang, Meo Vac and Dong Van. On the route, we stopped in several places: the viewpoint and market of Quản Bạ, in a small village to take a break, Yên Minh to have lunch, the viewpoint of Nho Que in Ma Pi Leng Pass and, finally, we arrived at Dong Van. We also stopped to see the landscape from the road, to see how some guys had just captured a snake, and to pee 😂. After a rest, we climbed to the French Fort called Don Cao, and we walked around the old quarter. We slept in Dong Van. ➽ Day 2 – We started our 20 km Trekking along the Geopark, from Dong Van to a small village close to Sa Phin where we stayed in a Hmong homestay. We passed through small villages, remote schools, corn and rice fields and marijuana plantations (used to make fabric). Amazing views during all the way! We didn’t see anybody but locals working in the fields and children in the school. A brief anecdote during the trekking: we met a man who carried a dead pidgeon in his pocket (his dinner he said), he invited us to his house and told us several disturbing histories about a cave. I can’t say more because it’s a secret and, honestly, I don’t think I should tell it 🤐. ➽ Day 3 – 6 km Trekking to Sa Phin. This route run over the road mainly. Along the same road, the minorities go to the Sa Phin’s market. We visited the market and the Hmong Palace. This market might be the only one that opens weekdays, specifically on Tuesday. In this village, we saw tourists who were visiting the palace but they arrived too late for enjoying the market. We had lunch at a restaurant close to the palace and, after that, they picked us up by car (with our luggage inside) and we returned to Ha Giang. On the way, we stopped in a factory where they make hemp fabrics. When we arrived at Ha Giang we took a shower (two days of trekking without being able to do it 😅) and finally we went to the Ha Giang bus station. We departed at 8 pm to Hanoi. 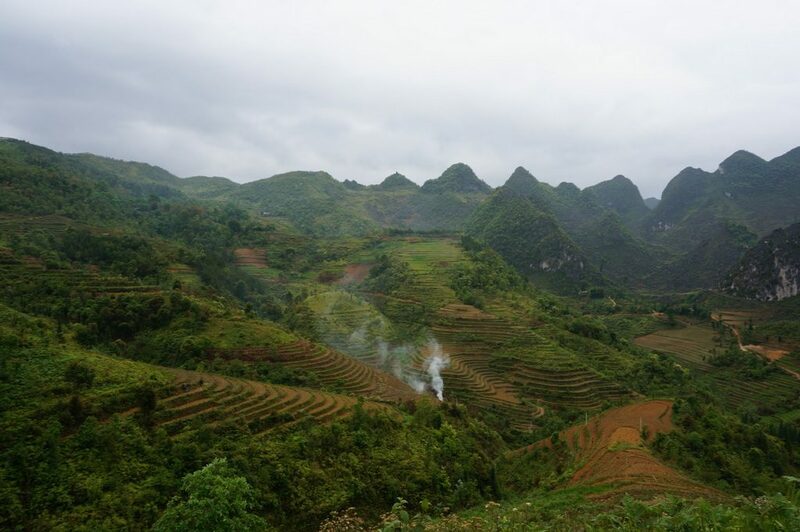 I searched several times for tour agencies or companies to explore Ha Giang, it was difficult. I didn’t find any agency which looked reliable, and besides, we wanted to go on a customized tour. We were clear about what we wanted to see and do. Finally, I found this web Mr. Hung Tourism which has a few reviews on TripAdvisor. We got in touch with them and decided to hire a private tour to visit the essential places in Ha Giang. In summary, we liked the tour, and it complied with all our expectations like activities and places to see: markets, homestay with ethnic minority, viewpoints and trekking along the Geopark through small villages. The only complaint is that the plan was changed. The guide told us by email that we would go to see Dong Van’s market. The initial plan was that they would pick us up at the bus station at Ha Giang about 3.30 am and then we would go to Dong Van, so we would have arrived there in the morning. Finally, it wasn’t like this. When we arrived at the station we went to sleep in a guesthouse instead of going directly to Dong Van. In the morning, we went to Dong Van pass through Meo Vac. Obviously, we would be late to visit the market (since around 12 am the market is over). So, we didn’t stick to the plan. As you’ve already read, we visited another two markets. Both are very authentic, and we could see how the minorities get together weekly to sell their products. Because of the change of the first day, part of the plan was modified, although it was still good. We had planned two days for trekking, the first was 20 km and the second one was intended to be 16 km. The schedule of the second day changed. The Sa Phin Market happens on Tuesday, so we decided (and the guide as well) to take the opportunity to visit it. Then, the plan become a 6 km trekking to the market and the visit to the Hmong Palace (already arranged). We liked the change. I suppose they modified the agenda because we skipped the Dong Van market. During the tour, we had two guides: Mr Hung and a young man named Hòa (we called him Juan, it’s a Spanish name and it sounds equal to Hòa). Mr. Hung picked us up early-morning hours and we spent all the first day with him and the driver. He has a good sense of humor, and if you like jokes I’m sure you’ll have fun. He’s nice and easygoing, he took care of us. Hoa was 21 and was our trekking guide. He was very likeable but maybe he has a little smartphone addiction 😂. Honestly, they were a great company during the trip, although we expected that they told us more about minorities. In conclusion, although the initial plan wasn’t fulfilled, I recommend Mr. Hung because our little adventure was very nice, interesting and enjoyable. Objectively, we saw all we wanted. In the next map, you can see the trekking route we did along the Karst Plateau Geopark, the markets which we visited, the viewpoints and other places that we saw during the trip. When the night bus arrives at the final destination (Ha Giang or Hanoi) the driver doesn’t warn you. He lets the passengers sleep because he thinks that the people don’t go anywhere until there is another transport, that means when it’s getting light. So, if that isn’t your case, pay attention around 3-3.30 am because in that time usually ends the journey. 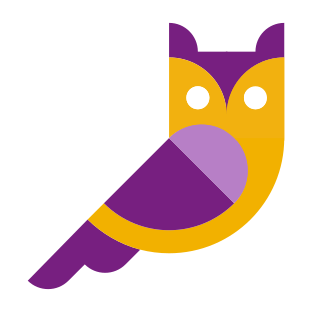 It isn’t necessary to book the night bus ticket; people buy it at the moment. Is the night bus safe? Don’t worry about the bus running at night nor about the road being dangerous. The road is wide (at least the way I saw while I was awake) it isn’t like a mountain road, narrow and with many curves. In short, I would say that the probability of having an accident on this bus is the same if you go during the day by another transport or road. If you go by motorbike, you should honk before a curve without visibility. It’s usual, so if you hear a honk, that means a car or bus or another transport is coming. Be careful because the road is under continuous improvements and there are potholes and constructions. If you want to go from Sapa to Ha Giang, first take the bus Sapa – Lao Cai and then Lao Cai – Ha Giang. On this web about tourism news in Ha Giang might appear information about a new possible bus route between Dong Van and Meo Vac. The page is in Vietnamese, so you need to translate using the browser tools. In this area, the most of the accommodation is very basic, with a thin and hard mattress, although they have shampoo/gel and even toothbrush and paste. In any case, you can buy what you need on the way. Tips if you stay overnight with an ethnic minority Tips to plan your trip to Vietnam – Homestay. Thank you Lena for all your useful information and map. With my husband we are planning to go there next February. Since many years we wanted to go to Ha Giang but always something happened to prevent this trip, so we hope it will be possible this time. However, I’m not sure about the weather at this time of the year ? Hi Janine, thanks for your comment 🙂 February is a good month to travel to Vietnam, I could say it’s the best! In the north, the weather is dry and the skies are clear, maybe some rain. The average temperature is 17 degrees Celsius, so you need suitable clothing (in the rest of Vietnam it’s between 25 – 28º C). Regards and enjoy the trip! Hello Lena – great post – very informative and very helpful. One quick question. As far as travelling – you indicated motorbike and public transport as options. Would rental car also be an option? I do not mind riding a bike, however my wife is not so comfortable doing that (we are both 65). We have driven in many places (including Thailand) and are comfortable with poor road conditions, so I was wondering if that would be an option. Appreciate any help. Hi Jim, thanks for your comment! The driving laws in Vietnam are different from those in Thailand. I recommend reading this: Do I need a special driving licence? and also check your government’s information on Safety and security and Laws and culture. So, I think the best option for you is to rent a car with a driver. No car-hire agency will provide a car to a foreign visitor without including the driver, although you can try if you have a valid driver licence. Nice post. Ha Giang is one of the most beautiful provinces in Viet Nam. Every roads, every hills, every streams, and rice terraces is wonderful in every corners. The best feeling is riding a motorbike and go slowly in curse and high road to see sight-seeing, sink in the natural beauty and go through some waterfalls and streams. Everything is just stopped for awhile because of the beauty of mountains, hills, rice terraces…especially the friendly locals. I love to come to Han Giang in ” Tam Giac Mach” blooming season, It is such a great time to explore the true Ha Giang, and see the white flower that is an amazing stuff to see and take some photos to save our memories in Ha Giang.